The Fame Club on Roblox is a group created by me (Ajedi32) that includes many famous people on Roblox. There are over 200 members on the fame club, and every member is required to have at least 100,000 place visits or 30,000 profile views. 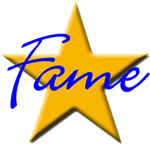 Members of the fame club are encouraged to "discuss fame and stalkers and brag about our money, place visits, unread messages, etc.". There are currently 5 ranks in The Fame Club, not counting the ranks of Owner and Admin. These ranks are listed below. Member - Must have at least 100,000 place visits or 30,000 profile views. Elite - Must have at least 250,000 place visits or 75,000 profile views. Uber Elite - These members are hand-picked to represent the most famous players in the group. Approval Assistants - These members perform basic duties in the fame club, such as approving members and changing ranks. Group Moderator - The group moderator can approve members, exile users who do not belong in the club, and delete posts.